Line 13x9-inch pan with foil; spray with cooking spray. Prepare cake batter and bake in prepared pan as directed on package. Cool cake in pan 15 min. Invert cake onto wire rack; cool completely. Transfer cake to platter. Tint 2 cups COOL WHIP with food coloring; spread onto top and sides of cake. Spoon remaining COOL WHIP into resealable plastic bag. 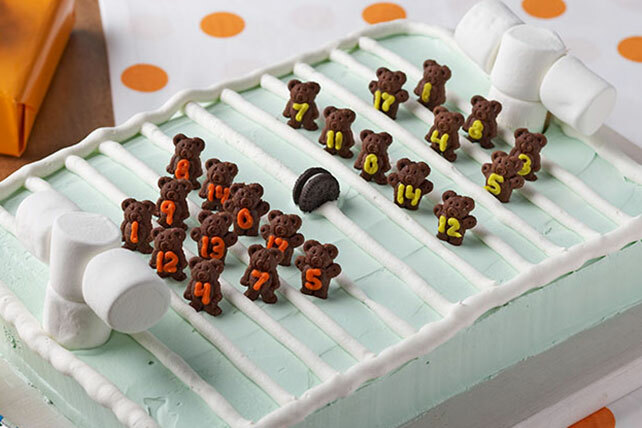 Cut small piece off 1 bottom corner of bag; use to draw outline of football field on top of cake, then add yard lines with remaining untinted COOL WHIP. Add graham snacks for the football players, and OREO Cookie for the football. Thread marshmallows onto toothpicks; use to make goal posts as shown in photo. Add to top of cake. Remove and discard toothpicks before serving cake. Decorate the bear-shaped graham snacks with 2 different colors of decorating gel or icing for the colors of the opposing teams.